Alright! The first share has arrived! 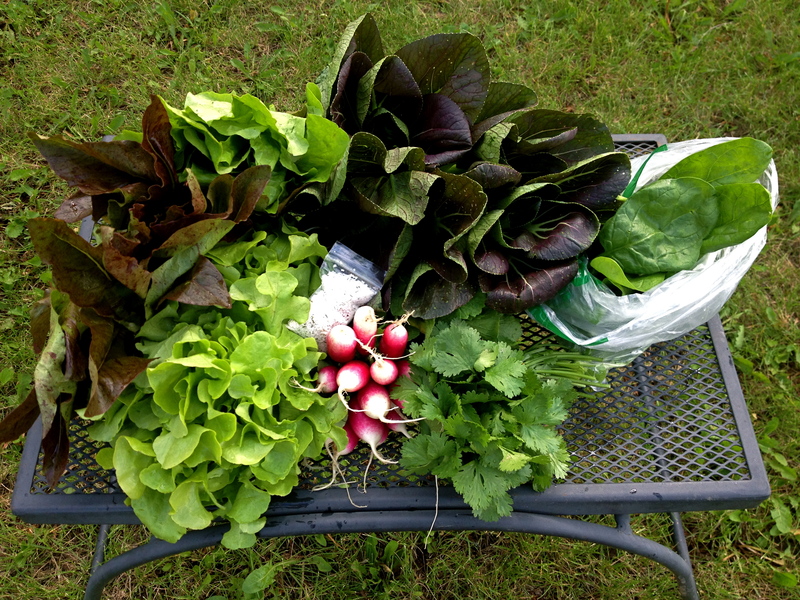 Salad days are here as we kick off the late spring segment of the CSA. Unpacking allows you to survey the goods and gives you a chance to make sure things are properly stored for the longest shelf life. Anything that has a leafy green and all root vegetables will store much better inside a plastic bag. Because we try to cut back on the amount of plastic we send out not all items that store best in bags will come in them. For example: your Pac Choi and radish will do okay hanging around in the crisper for several days but will keep much longer and retain their crunch if you keep them in a produce bag. Your head lettuce and most other greens will store best when they don’t have excessive moisture in their bags. We harvest, wash and dry them the morning of delivery, but we recommend you wash and dry it again (with a salad spinner or patting leaves with a dry towel) and/or put a dry towel in their bag to absorb excess moisture. We clean everything before it gets sent out to you, but it’s always a good idea to clean it again. Some items like the Pac Choi can only really get cleaned once they’re cut apart. 4) Unfold your box after emptying by squeezing the short flaps on the underside of the box out to dislodge the insert tabs. Bring your box back to your drop site next week and leave behind for us to pick up and re-use. There is a special edition to this box: Lovage salt. Lovage is a perennial herb that looks and tastes like a skinny, pungent celery and is best used as an herb due to its strong flavor. Heather dehydrated the leaves and ground it in with salt for a unique seasoning. It adds extra herbaceous depth to anything you would normally salt. We’ve been making one of our favorite spring snacks with it: Radish Canapé (see recipe below) and it is also particularly well suited as a Bloody Mary rim salt. Also of note is the Pac Choi in this box. Pac Choi (or Bok Choy as some people prefer) is a great addition raw to salads for some extra crunch, or lightly sautéed in a stir fry. The refreshing stems are the most prized and the leaves are delicious too. You may notice the Pac Choi has little holes in it, giving it a slightly beat-up appearance. These are from flea beetles that come in the early spring and feast on all the leaves of our brassica family plants. You may remember seeing photos in the last update letter of all the row cover fabric we lay over these plants to keep the beetles out—well despite all our efforts they managed to break into the Choi! The result is a little cosmetically damaged, but still delicious product. Slice good quality French baguette into 1/4 to 1/2 inch thick slices. Spread thin layer of good local butter (room temp makes for easier spreading). Cut French breakfast radish into thin round slices, cover buttered bread with layer of radish slices. Sprinkle Lovage salt on top to taste. Its always good to make about double what you think you would want for this appetizer as they will go quicker than you think! Stir together 2 tablespoons sugar and 1/4 teaspoon cinnamon in a small bowl; set aside. Whisk together flour, 2 tablespoons sugar, baking powder, pinch of salt, and ginger in a medium bowl. Stir together milk and butter in another small bowl. Stir milk-butter mixture into flour mixture and set batter aside. Gently fold together raspberries, rhubarb, lemon juice, remaining 3/4 cup sugar, pinch of salt, remaining pinch of cinnamon, and 2 tablespoons water in a large bowl. Transfer fruit mixture to a large straight-sided skillet. Cover and bring to a boil over medium-high heat, stirring occasionally. Using two spoons, drop 8 large dollops of batter on top of fruit mixture, spacing them evenly. Sprinkle with reserved cinnamon-sugar mixture. Cover; reduce heat to medium. Cook until batter is cooked through and juices are bubbling, about 15 minutes. Serve warm drizzled with cream. We hope you all enjoy the first box of the year and look forward to many more good ones to come! oh my gosh, that lovage salt is the bomb! used it with some maple grilled chicken last night and it was awesome! we’re super happy with our first box! I’ve only in the last year begun to eat mustard grenes, collards, and kale. Before, it was lettuce (iceberg at that) and spinach. Now, I crave the grenes like nobody’s business I even eat them for breakfast most days! Seeing your photo makes my mouth water as I begin to dream of kale with tofu, avocado, and tomato on a wrap for lunch. YUM! Hey Heather and Brandon, We just got our medium size box. It was just like Xmas 🙂 Nice and generous for a first box, especially considering the season. Very beautiful. Nick immediately started chomping on several of the bok choy leaves, so thank you. Great job. We look forward to the next one.